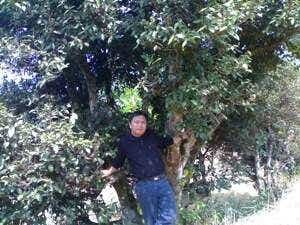 Qianjiazhai, my plot of wild tea forest can’t really be found on a road. The best I can give you are coordinates. You can find me at 24 north and 101 east. The altitude is 2100-2500 meters depending on where you stand. The full area of all of our plots, making up the cooperative is 4,700 acres of mountain land nestled within Mount Ailao national forest preserve, protected from development and outside influence. In addition to the wild tea trees, we have planted some Huangshan varietal trees and local varietals with their own distinct characteristics. Our oldest tree is about 1800 years old. Sadly, in the nineties, some farmers cut down some of the old trees to plant tobacco. We talked them out of moving forward with planting the tobacco, but thought the damage would be permanent to their section of the forest. Miraculously, the root systems in the ancient trees runs so deep, that they came right back as the next year like nothing had happened. I like to call my black tea Qianjiazhai Forest Daughters Black (maybe for my own daughter, or maybe because the tea is a daughter of the forest itself). 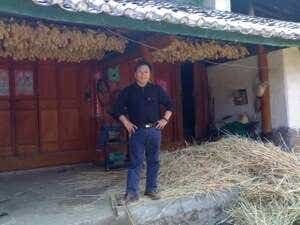 I use the most traditional methods of oxidization, and dry the tea in the Yunnan sunlight. My black tea has a graceful aroma and flavor, and has a brilliant translucence. In Qianjiazhai, we believe that this black tea is good for blood pressure, keeps the skin healthy, and the mind sharp in old age. Master Han sent a few pictures to share showing off his house and nearby trees. Posted on January 3, 2013 at 4:57 pm. 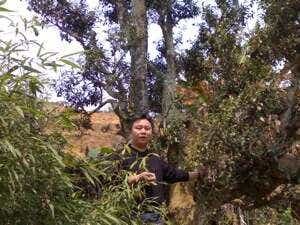 I loved reading this information about Master Han and seeing the pictures of the tea trees. I will think of this when my tea comes and I experience tasting the tea, the fruit of the Zhenyuan Dongsa Farmers’ Cooperative’s labor. The opportunity to drink tea like this is exactly why I like Verdant Tea. Keep up the good work! His wild picked black tea is the first black tea I have ever had that I actually like. I also love how he has to give coordinates for his location! I hope Master Han will grace us with more of his tea and his insight. I felt like the tea was romancing me! I’m always amazed by the history that exists over there as America seems so young. I love the pictures. Climbing a tea tree looks like fun! Such a wonderful story! I can’t wait to try the tea! Sipping on some Wild Picked Yunnan Black right now – can’t wait to review it – it is perfection. Thank you Master Han and Verdant Tea for bringing us this selection! Thanks so much! Glad you like that one as much as I do. I feel lucky that Master Han is willing to work with us. Me too! It is truly special! My full review will post on SororiTea Sisters on the 31st! This tea is truly spectacular! It’s terrible that old tea trees were being cut down to grow tobacco. I can’t judge the farmers, though, they do have to make a living. I like to think that by buying this tea, I am part of a system that incentivizes farmers to preserve these tea forests. It’s interesting what Master Han the tea plants rebounded after being cut (I’m supposing that new growth sprung from the old root systems). I wonder how this affected the characteristics of the tea made from those plants. I’ve always wanted to try tea from a tree as old as that, that’s cool! Reading stories like this makes me feel like i’m a part of the whole process. Keep ’em coming! Very neat! Master Han’s tea sounds intriguing – and I usually don’t care for black teas.